Only one blogger - me - was hurt during the preparation for this post. I had planned, for today's post, to capture some wintry-wonderland, Christmas-themed picture from the net and paste it on my blog to wish you all Merry Christmas. Then I looked out the window and thought -"Heck, I don't need any picture from the 'net'. My entire yard, street, village, county and beyond is a wintry wonderland. So I began to take some pictures of the glorious scenery right outside my door. I did this from inside -where wintry wonderlands are best observed. I opened the window in the bathroom to get a shot of the icicles and realized the screen would darken the photo. Best take out the screen. To do that the blind needed to be raised all the way to the top. It is one of those heavy, wooden, wide-slatted blinds and just as it reached the top of the window, two feet above my head, the lock holding it in place gave way and it crashed down on my face. I have a great, red scratch running down one side of my nose. I did take a picture to show you, but trust me when I say a close up of my pores and wrinkles would have been hard on your stomach. But the icicles look great. Here is what I was looking at. From the patio doors. The Church behind us well hidden by the wintry scene. So as you can see, there is no shortage of winter wonderland scenes here at the Harris Household. For the next couple of days, at least, I will look at it as mood-inspiring weather. May you all have winter wonderlands to observe this Christmas. Thank you all for reading my blog this past year and I'll be back writing again in 2014. Grrr! Sweatrrr was giving me griefff. And so, there has been a change of plans. Grief was coming at me from many directions while knitting Sweatrrr. First there was is my yarn of a different gauge. Not a difficult thing to change gauge, but Sweatrrr starts with many, very short, short-rows. With my gauge being off by only a slight amount, when I multiplied the pattern numbers by my gauge factor, I was ending up with many, almost-the-same and/or fractional numbers. Every new row was a guess as to whether to go big or go home. Then there was the issue of the sleeve cap seam placement. I am fussy about that. To make me happy, that seam must sit precisely on my shoulder bone. Despite arranging the piece around my neck several times, I couldn't tell for certain where that seam would sit until the work was joined in the round. Joining didn't happen until the centre-front, neck line was completed. When I tried it on, I didn't like what I saw. There seems to be a hump behind the shoulder seam. Would it go away with blocking? Would it stay away after blocking? Did I carry on, hoping for, but unsure of, flat shoulders? Then too, was the issue of the colour squares. They run up both centre front and back and are done via intasia - but in the round. The designer has an ingenious way of doing intarsia in the round - but for me - I thought it looked less than, or my execution was less than, professional/perfect. Back to a tried and true. Top down. Raglan Sleeves. Cardigan. Begun with one of the contrast colours. That makes me feel better. One-Of-A-Kindness coming from the unique design baubles of Sweatrrr - the coloured squares - just on the front this time - and the great, contrast-coloured sleeve insert. Sort of like tarting up your old decor with fresh pillows. Works for me. I'm off to a great start. A change is as good as a rest the old saying goes. Because most importantly - I'm having fun now. My niece - the one that married in New Orleans and is now the new Mother to Baby Jack - is very good about sending me pictures of Jack wearing the clothes I knit for him. Last weekend, at our family, Christmas get-together, I gave Jack the Santa hat I knit. This week, I received these pics. Every baby is adorable - but isn't he just! Brings a smile to one's face, doesn't it? Well, where has the year gone? Today was the last knit group for 2013. To celebrate there was food. Knitting, food and laughter. A perfect afternoon just before Christmas. Wilma worked on last minute Christmas gifts. She picks up the crochet hook when time is of the essence. Here she has pot holders and a towel for the stove. Look at this complex piece Jean has on the needles. This is a vest that is a labour of love. But look what Jean noticed last night. Now, go back to the upper picture and see where that wonky cable is located. Yep, that's right. Close to the bottom. Jean says she is going to live with it. She says there has been too much hard work to rip back. But Ingrid and I tried to talk her into cutting the stitch and crossing it correctly. Jean was skeptical. I believe she felt that repair method might end up being more headache than the error. Sharon is working on Wingspan. Garter stitch and short rows. An easy knit she says. Lorrie was also working on neckware. The Honey Cowl. With two great blue yarns. Doreen arrived looking very festive. Isn't that a great sweater? Knit by a friend and gifted to Doreen. Lucky lady, you are Doreen. Here's a sight you don't often see. Take a look at what Ingrid is doing. Can you see where the circular needle is? Around her neck. She is ripping back. She was meant to increase across the row - that would be the row about 4 inches back - but discovered that she had decreased. She doesn't look too happy, does she? And did I mention there was food? A fun time for our last get together of 2013. 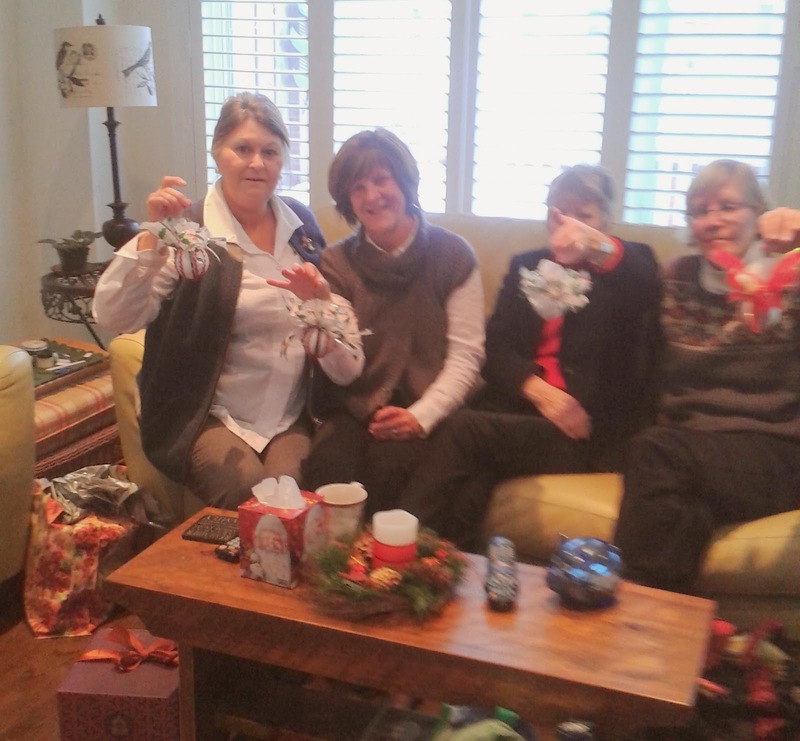 The Meaford knitters wish you all a very Merry Christmas. Thursdays, have long been my day for knit group. But, about a year ago now, a second group of knitters came into my life. I meet with this group on Wednesdays and for the last year, they have allowed me to teach them and encourage them on their knitting journey. This group is not normally, fodder for my blog. These knitters came into my life as a result of a disagreement which resulted in a switching of allegiances. Filled with intrigue, the abdication was fraught with tension. As a result, I am protective of them. To blog about them, I feel, might expose them to nastiness and vindictiveness and so - I give them their privacy. But. Today was so special, I am breaking my own rule. With Christmas and New Year's Day both being on Wednesday this year, today was our last meet-up until into the new year. We had great fun, with glue guns, lace and fancy trims, making decorative Christmas balls. One of these clever ladies decided that we were a group of 'ladies with balls'. Indeed we are. Centre front is farther away that it seemed at first glance. I am not much closer to it than I was yesterday. I did though, last night, arrive at my first, centre-back, colour patch. Both front and back centres have a five-stitch panel of contrasting colours and different stitches.They alternate, at knitters will, between stockinet and reverse stockinet with either of those in main or contrasting colours. My contrast colours will be the dark brown which matches a stripe in the skirt but of which I have only a small amount of yarn, the bright orange that will also be at the neck and the triangular sleeve insert and also I will use the cream coloured 'One Of A Kind' yarn on its own. In the sweater, that ceam is held together with two strands of the very fine brown tweed. But as one of the colour-patch colours, I will use it on its own. Although definitely not centre- front, it was still fun to try out that first colour patch square. Marching on towards centre-front now. Sweatrrr is progressing nicely. The try-on I thought know I should do, has been delayed. Without a full circle for the neck, the piece slips and slides around too much to actually get a good idea of fit. The try-on will work better once I reach centre front neck. You can see it doesn't even reach centre front on Teddy yet. The pattern is still a conundrum to me. Very confusing to read, very easy to knit. Weird! The confusion probably stems from the issue of mother tongue. Perhaps English is not the designer's first language. I am guessing at that but the way concepts are expressed in the pattern lead me to think that is the case. One of the great design features of sweater is the faux seam incorporated into the body of the sweater, adjacent to the sleeve cap. Kind of like the 'two negatives make a positive theory', the fake seam lends authenticity to the fake set-in sleeve, I feel. I expect not too many more rows to do before the left and right fronts can touch in the middle. Originally I had thought I would make this into a cardigan, but that original thought has taken a bit of a back seat. A pullover might be just the ticket. Either way, I will join one centre stitch for the try-on. Once I stand in front of the mirror, it hopefully, will become clear to me if Sweatrrr should be a cardigan or pullover. Maybe by tomorrow. Following the giant gauge swatch and technique practise, I did manage to find time this week to start Sweatrrr. There were a few Christmas parties - book club, then knit group and now both Saturday and Sunday, set aside for family events - that have deterred me from great progress. But here I am so far. The back neck and three of four shoulder portions finished. The left front & back shoulders plus the right back shoulder are done. Just the right front to do. Will it fit? Time will tell. This pattern has terminology and methodology that is totally foreign to me. Terms like Sl1 followed by a dunce cap accent was one I had never seen before. It means to pull the stitch tightly over the needle until the two legs of the stitch are almost on top of the needle. It is a method of short-rowing that in my little opinion could have been more simply described. Once I have the fourth and final shoulder part finished, I think I might try it on to see if I have correctly estimated the number of stitches to cover the distance across my shoulders. It is important to me that the sleeve/shoulder 'seam' sit precisely on the shoulder bump. That to me is a perfect-fitting set-in-sleeve. I am not a big fan of set-in-sleeves. To me they make the back look too square, too masculine, too football uniform-ish. I much prefer raglan sleeves. You know where this is leading, don't you! If those seams are not exactly where I want them, I will have to rip back of course. And if I rip back, - why not make a top down raglan? Of course I did want to try Tricosa's take on Suzie M's contiguous method for knitting a sweater all in one piece, top down, with set-in-sleeves. When I knit Colour Block, I developed my own combo pattern, combining Suzie M's and Ann Budd's methods of top-down, set-in-sleeve construction. Asa Tricosa seems to have come up with yet another method. Always intrigued by new methodology I thought I'd give it a go. But my measure of greatness always includes easy. So far, while the knitting of Sweatrrr isn't difficult, reading and understanding the pattern sure doesn't fall under the easy column. I really like Asa's design features in this sweater. The columns of different stitches and different colours down both the centre front and back and the giant triangle of contrast colour in the sleeve. I will give the Tricosa Technique of neck/shoulder/set-in-sleeve construction a fair try. But I'm not afraid to deviate if I am not having fun. Have a great winter-y weekend everyone. Safe travels if you are on the road. Christmas Party Number one for knit group. Yep - there are usually two. Today we had a pot luck at Sandy's house. Next week there will be goodies at the library. Sandy B lives in a beautiful, old, Victorian home just a block from the library. With all her space, she is the perfect candidate to host our get-togethers. Look who is here! Meghan. Meghan, married to the Australian reciter of poetry. It is wonderful to have you back in Meaford, Meghan. Nan and Sandy - intent on yarn. No surprise there. Ruth, we haven't seen lately. But offer them food and they all come. Isn't this a dining room? That's a sleeve Carol is showing to Sharon. One honkin' big sleeve. Lorrie starts a shawl and Nan's socks pose for the camera. We haven't seen Doreen all fall, but were so glad you could make it out today, Doreen. One fine group of knitters. A Currier & Ives day. Snow. A big, old, but wonderfully cozy, Victorian home. Ladies, food and knitting. It transcends the ages. Such times I wish for all knitters. Not my first self-given gift, but it was still a pretty exciting time here at the Harris House when Fred brought the mail home. Although there is nothing special about being a Canadian girl and an Anne fan, there is definitely something special about being a Canadian girl, an Anne fan, a knitter and the owner of a book of Anne-inspired patterns. Joanna Johnson has published this delightful little book of Patterns For Kindred Spirits. The book has 8 appropriately-named patterns: Anne's sweater, Diana's Hat and Gilbert's Scarf to name a few. They are interspersed with lots of L.M. Montgomery's black and white photographs of some of the PEI places important to the Anne stories. This book, like the Anne books, is a delight. The models couldn't have been more carefully chosen. See Diana and Anne. They look exactly as my 10 year-old imagination pictured them. What hours of fun this book will give me. Thanks, gift giver. Oh - that would be me. The fingers took their tranquilizer and I calmly, determinedly and hopefully knit a swatch. I am a fan of big swatches. Often, knitters read the gauge on the ball band and cast on just that number of stitches. But that means you are trying to measure/count curling edge stitches. Not an easy nor accurate thing to do. My preference is to make a larger gauge swatch. Use garter edges to prevent curling and measure off the 4 inches in the centre of the flat-lying portion of the swatch. My prescribe gauge was 23 stitches. Using two strands of the very, fine, brown tweed held together with one stand of the cream-coloured, mixed-fibre yarn, I cast on 36 stitches. Pre-blocking, the gauge was 22. Close enough I thought. But I had a suspicion that this fabric might stretch after blocking - and it did. Post washing it measured, laid flat, 21, but shaken and fluffed, 20 stitches over 4 inches. Hmmm. I settled on 20.5 as my achieved gauge. What to do. Should I re-do the swatch using a finer needle? Well, I could have. But I liked the fabric I had produced with my 4 mm needles, so decided to stick with what I had. It does mean however, that I must use my by-now, famous-I'm-sure, gauge-changing formula. My gauge divided by pattern gauge to achieve a factor by which I multiply all stitch counts in the pattern as I come to them. The observant of you will be asking - What is that bra-like cup at the top of the swatch. Well, not only can a swatch give you gauge, but also, it gives you the opportunity to practice unfamiliar techniques. What you are looking at is my first ever go-round of German short rows. The designer uses them, in this pattern, to create the shoulder slope. This being a top-down design, that slope happens shortly after cast on, in a highly visible location on either side of the neck. I thought it a good idea to try out those new-to-me short rows before starting the sweater. Even here, my first go-round, I think those German Short Rows look darn good. None of the bulk and sometimes little hole that a traditional wrap and turn can produce. So - prep work done. Off to start the real thing. If, according to my knitting needles, we have already hit Boxing Day, then this next project is my 'post' pre-Christmas knitting. This afternoon, I am going to wind the wool and hopefully cast on for this great sweater. Since the day the pattern first appeared on ravelry, I have been thinking about this sweater. The stars were slowly aligning and finally, yesterday, I purchased the pattern and today, am anxious to get started. Mine will be cardigan-ized so will look more like this version. The first star hopped into place at the Church garage sale and auction last June. One of the members, a lady somewhat more of a certain age than I am, donated two Scottish, pure wool, pleated skirts for auction. I loved them both. One was in shades of green and one in shades of brown. I tried them on and they both fit. The decision was strictly colour. I chose the brown and was winning bidder. I love it. Old fashioned, yes. Classic, yes. My colour, yes. My size, yes. Nothing better - except the sizing. Today, despite weighing several pounds more than I did at graduation, I still wear the same size - 10 petite. Vanity sizing is such an ego stroker. The tag on the skirt, sized a generation ago, reads 16. I might just have to remove that. Being June, and in no rush to wear a wool skirt, I hung it in the closet to let the idea of what to wear with it start to percolate. Sure, I probably have a cardigan or two that together with a white blouse would look nice. But I wanted to take this skirt over the top. It had been lovingly cared for by a lady I see frequently. She only donated it because she is no longer a size 10. Or 16. Like getting out the good china for company, or shaving my legs mid-winter, I want her to know that it is special to me. Another star fell into place when I went stash diving. I have lots of these yarns. They are perfect compliments to the skirt and will make a great, non-matching, matching sweater. But still I felt they needed a pop of colour to take it over the top. Oct 2, the last star fell into place. That was the day that my Collingwood knit group and I, along with knitters from Southampton and Meaford went on our Wool & Wine Tour. We stopped at Riverside Yarns in Owen Sound and there I found this colour of Cascade 220 Superwash DK. DK is a perfect weight. By double stranding the tweed cobweb weight and knitting it together with a single strand of the One Of A Kind yarn, I hope to achieve DK. So the Cascade will work perfectly. Every so often, I will throw in some of the limited supply of dark brown. The perfect colour combo for a great sweater for my skirt. A swatch is probably in order. My fingers though will have to take a tranquilizer as they are itching to get started. The days here, have been extraordinarily dark and grey. Not a bit of sunshine to be had. Sharon, on vacation in Cuba, was most likely the only knitter from the group to see the sun today. But our at-home knitters didn't seem to mind. Their laughter and talk and knitting brightened the day. Today we had a reunion of sorts. Joanne was in town. Spending most of the winter a couple of hours away at her son's house these last few years, means we don't see her often. We are always glad to catch up with her when she is in town. She was wearing her diagonal, sock yarn scarf. And from time to time, she was wearing Gail's Newfie Mitts. Gail was the other knitter we haven't seen in some time. Having cataracts removed from both eyes this fall has kept her 'otherwise occupied'. And imagine this! She used a doctor that made appointments for Thursday afternoons! She did manage some knitting though. For her sister, she knit a warm fuzzy, diagonal scarf and matching Newfie mitts. The ones she almost lost to Joanne. Mittens were on several knitters' needles to day. Wilma is having fun with Thrumbed Mittens. but mostly there was laughter with our knitting. Today, feels like a Boxing Day of sorts to me. Well - minus the sales and left over turkey. Last night I finished the final item on my Christmas knitting list. An Easy Peasy Scarf for Fred's Step Mom. A stash buster for sure. Step Mom has strawberry blond hair and wears lots of browns so this should be a hit. Pattern: My Own. Cast on as many stitches as required to give you the length of scarf you want. Here I cast on 125 but for a longer scarf, I measusre the cast on against a beach towel. Yarn: Lots - at least 5-7 different yarns. Use different textures, and most importantly, different gauges to give the scarf its thick, thin very tactile feel. Needles: 8 or 9mm - the big needles give the scarf a very open appearance. Instructions. Change yarns every row leaving a tail of about 8 inches. Every time you have two tails, tie them together. These tied tails form the fringe. Change yarns randomly. I keep them in a bag and reach in blindly. Whatever comes out is what I use. The random selecting of yarns gives the scarf its wonderful, creative appearance. Too much thought in yarn selection makes for a more controlled, disciplined scarf. This one, with 125 stitches, finished at 5 1/2 inches by 51 inches ( not including fringe) and took two evenings. So, if you are so inclined, you still have time before the big day. But me? It's Boxing Day in my knititng world.